Achieve a golden glow worthy of a Bondi Beach-goer with the Bondi Sands Self Tanning Lotion. Enriched with Aloe Vera and Coconut for soft, sweet-smelling skin, the lightweight self tan glides on like silk and dries in seconds for a streak-free, naturally bronzed appearance. The increased levels of DHA ensure your golden colour lasts, while Vitamin E moisturises and hydrates skin for a smooth, even application. The result is a gorgeous sun-kissed glow that gives the impression of days spent on the Australian sands. Suitable for light to medium skin tones. 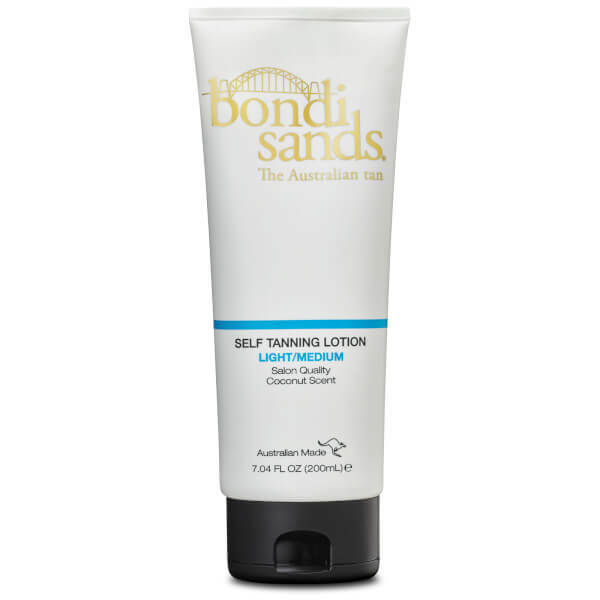 For an even, streak-free tan, use Bondi Sands exfoliation mitt to ensure your skin is clean and free from any moisturisers. Squeeze liberally onto your application mitt, using long, sweeping motions to smooth over legs, arms and body. Use remaining lotion for face, elbows, and knees. For those hard to reach places try the Bondi Sands Self-Tanning Back Applicator. Skin may be washed after one hour. For a longer lasting, darker tan leave for up to 6 hours before showering with warm water. Gently pat skin dry. For the deepest tan re-apply 30 minutes after initial application. Water, Dihydroxyacetone, Ethoxydiglycol, Glycerin, Isopropyl Palmitate, Aloe Barbadensis Leaf Juice, Stearyl Alcohol, PropyleneGlycol, PPG-20 Methyl Glucose Ether Distearate, Steareth-20, Dimethicone, Polysorbate 60, Glyceryl Stearate, PEG-100 Stearate,Magnesium Aluminum Silicate, Xanthan Gum, Cetyl Phosphate, Bisabolol, Farnesol, Fragrance, Triethanolamine, Phenoxyethanol,Methylparaben, Ethylparaben, Butylparaben, Propylparaben, Isobutylparaben, Diazolidinyl Urea, Caramel, Blue 1, Red 4, Yellow 5.